(Family Features) When winter approaches, it brings a number of distractions and factors that tend to keep people from getting outside and staying active. From holiday parties and vacations to bad weather, it’s important to keep health and exercise top of mind throughout the busy season. This is especially important for your furry friends since they depend on their owners to keep them healthy and active. Help keep your dog happy and healthy throughout the holiday season with these tips, and for more information on healthy habits for your dog, visit IAMS.com. Keep Table Food on the Table – With colder weather comes heavier, heartier food. While you may be tempted to share some of your delicious dinner or toss your pup some party snacks, these rich foods can lead to digestive issues for your dog. If you want to treat your dog, try mixing a bit of wet food into his dry kibble for a savory surprise. Feed the Right Food – An important step in keeping a pet healthy is to establish and maintain proper nutrition habits, starting with selecting the right type of food. You’ll want to look for a pet food that includes high-quality ingredients, such as IAMS™ dog food, which also offers quality protein and essential vitamins and minerals to help dogs stay healthy and active during the colder months. The brand also offers breed specific dry dog food recipes, customized to meet the unique needs of six of the most popular dog breeds. Bundle Up – It may be too cold to enjoy an entire afternoon outside, but don’t forget, your dog has a fur coat and needs to stay active and expel energy all year round. 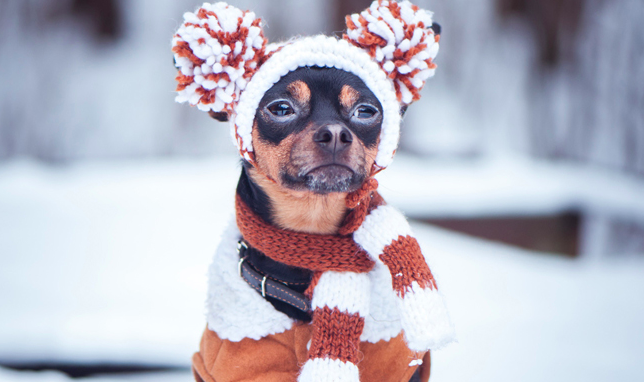 Make sure you have the proper winter gear for you and your pup. Depending on your dog’s needs, consider protective gear for winter, such as a coat to keep him warm or booties for his feet to prevent salt on the ground from irritating his paws. Stock Up on Toys – Some days, heading outside into winter weather just doesn’t happen. Whether it’s snowing, sleeting or just too cold, safety should come first. However, your dog will still have energy to release, so keep a variety of toys on-hand to keep him busy and active. Toss around a ball for a short-range game of fetch or play some tug-of-war with one of his favorite toys.